I’ve been experimenting with clay canes lately. 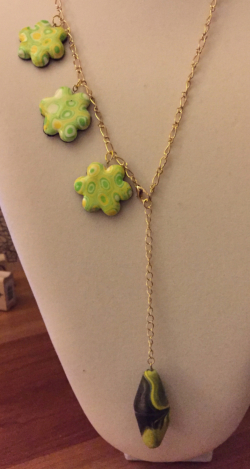 I designed this necklace a while back as a Christmas/Birthday gift for a friend. I thought the design might work for a Valentine’s Day-themed piece. So I went to Michael’s and purchased their Craftsmart clay to create the cane I needed. When I returned to my “studio,” I opened one of the packages and found that the clay was stiff. So I attempted to “condition” the clay as described in several blog posts I found. I rolled it in my hands…nothing. I placed it in a plastic bag and sat on it for several hours…nothing. Not having any clay softener, I returned the clay to Michael’s and asked for replacements. An employee took my clay and went to retrieve my new product. Before I accepted the exchange, I asked to handle the new clay. It was as stiff as the original clay I purchased. I declined to accept it and asked for a refund. I then went back to the clay shelf and found Sculpey III in the right colors. It seemed soft and pliable. My point is, if you’re planning to physically purchase clay (as opposed to ordering it online) check it before you buy it. Most of you experienced crafters probably know this, but it was a good lesson for a polymer clay neophyte like me! Cut circles of clay using the lid of your clay extruder. Stack the circles in an alternating pattern and roll out to a diameter that will fit in the extruder. Insert your rolled clay into tube of extruder. Add extruding disc (I used the large hexagonal disc) and screw on cap. Extrude. Once you’ve extruded your cane, cut 1/8” slices using clay cutter. Roll another sheet of red clay (down to setting 3). Arrange slices tightly on clay sheet, creating an area large enough to cut out one large heart and three small hearts. Place plastic wrap over clay and gently roll to fuse slices. Bake clay hearts per manufacturer’s instructions. Let cool completely. Apply Sculpey Gloss Glaze to each heart with small brush if desired. Let dry for 24 hours. Remove eye pins, apply adhesive and re-insert. Let dry. 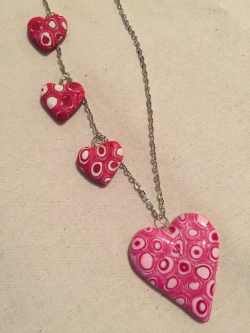 Attach large heart to chain using split ring. Attach small hearts threading split rings through chain links.